The BRIT Awards which took place on Wednesday in London had so many American guests and part of the shows guest were four of today's most famous faces, which came together for one earth-shattering photo! Taylor Swift, Kanye West, Sam Smith, and Kim Kardashian posed for an adorable pic together, which Kim later posted to her Instagram. 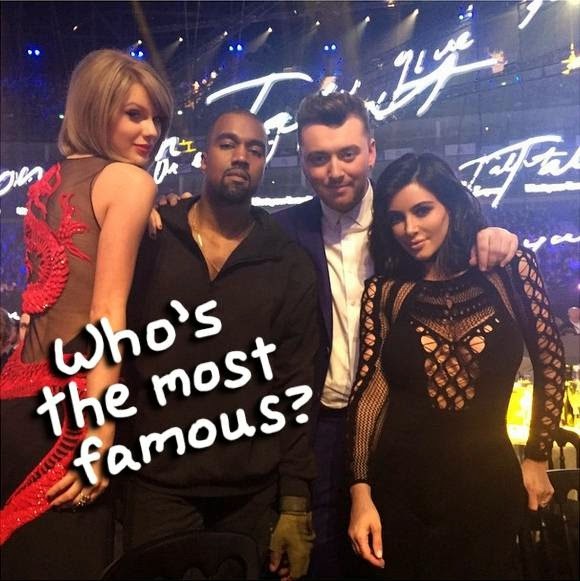 But what's most interesting about this pic to us is that all 4 celebs were involved in the awards show! Not only did Tay-Tay, Kanye, and Sam get to perform, but Kim was actually invited to introduce her hubby's performance, which is just the cutest thing ever! But, what we really want to know is which of the four is your favorite celeb at the moment??? Do not forget to use the share butttons..